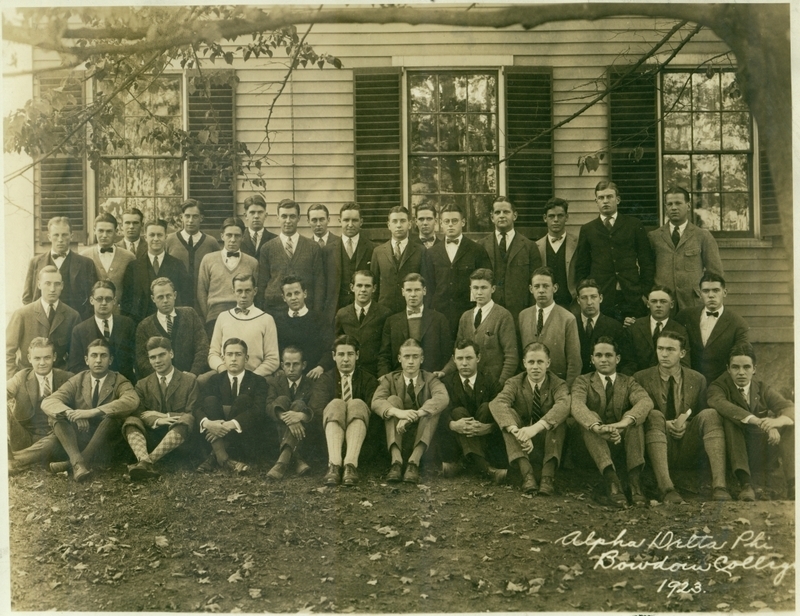 Group portrait of the members of Alpha Delta Phi, taken against the north side of their old house. Front row, left to right: Libby, Willey, Kelley, D. Marshall, White, Farnham, Sellew, Cutter, Sawyer, Carter, Ecke, Jackson (all Bowdoin 1927). Middle row, left to right: Thompson, Mealley, Smith, Priest, Spinney, J. Marshall, Genthner, J. Jones, R. Pike, Austin, Whalen, Leighton. Back row, left to right: Mason, Powers, Caughey, Barker, Goodhue, Small, W. Gulliver, Brooks, Hall, Blatchford, MacKinnon, Young, Rouillard, Bixler, A. Smith, Stalford, A. Pike.